Watch the TV series, the first film adaptation and then the sequel! Denzel Washington returns as what has been touted as his first sequel, reprising the role as vigilant fighter for the people. 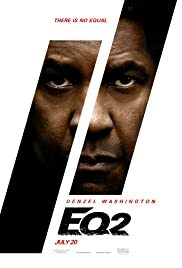 The lean and lazy plot involves EQUALIZER 2, Robert McCall (Washington) learning that one of his longtime friends, Susan Plummer (Melissa Leo, the best thing about the movie – watch her fight), has been murdered. McCall decides to return to his old ways and seek out, find and punish the perpetrators. In the mean time, he helps several Bostonians including a young black man who has the gift of painting, Miles (Ashton Sanders, from MOONLIGHT) and Fatimah (Sakina Jaffrey). In the midst of all this, he pines over the loss of his wife. He is still friends with his ex-partner, Dave York (Pedro Pascal), his pal and former partner in the CIA who turns out to be a and guy, quite early in the film. Dave has a family and children, which the story totally neglects towards the end of the film. Washington puts in his 2-cents worth as McCall even going over emotional in trying to lead Miles to turn over a brew leaf. Veteran actor Bill Pullman is largely underused as Susan’s husband, targeted to be killed being a ‘loose end’. The film has a few interesting points like the first appearance of Washington at the start of the film on a train in Turkey. When the camera first offers the audience a glimpse of him, he is wearing an orange beard with a white cap and glasses looking like devout Muslim. The scene is obviously milked for laughs. It is very funny, though I found self the only one in the theatre breaking into laughter. Director Fuqua also inserts a few suspenseful scenes that deserves mention, like the one in which Miles is hiding in a panic room where there is a two-way glass separating the killer and Miles. Impressive too, is the storm cinematography. The film’s climax coinciding with a hurricane arriving in Boston by the sea where the fighters engage in the fight out in the open amidst strong winds and gushing sea water makes a welcome change. This climax does remind one of the blowing tumbleweeds in the ending shoot out in THE MAGNIFICENT SEVEN, Fuqua’s last action movie. Cinematography is by Oliver Wood ( who normally does work of this kind in action movies like the BOURNE series and DIE HARD, who first gained attention with his work using natural light to light up the 1969 cult movie THE HONEYMOON KILLERS). One could argue that a hurricane in the climax might be distracting to the action, but one must give director Fuqua credit for trying something different. There was a clash of times for the promo screening for EQUALIZER 2 and MAMMA MIA2. I had picked EQUALIZER 2 as I hated MAMMA MIA one, especially having to watch Meryl Street jumping up and down the bed like an annoying teenager, not to mention hearing Pierce Brosnan sing. The latter film has so far gotten positive reviews compared to EQUALIZER 2, likely for the reason of expectations. One expect better and different from EQUALIZER 2 director of turning point films like TRAINING DAY. EQUALIZER 2 is not that bad. It is what one would expect from the action director – a generally slower moving actioner, with over quick fight edit sequences and lots of blood and gore.